We were interviewed by an Albany Advertiser reporter on our views of online shopping. One-third of shoppers in regional WA planned to do most of their Christmas shopping online, according to the Australian National Retailers Association. The ANRA conducted a recent survey of Christmas shopping intentions, which found people in regional Australia were much more likely to turn on their computers than shop at a local store. It found while online shopping was very popular in regional WA, only 10 per cent of regional Victorians would do their Christmas shopping online. ANRA chief executive Margy Osmond attributes this to Victoria’s liberal trading hours and she is calling on all other States to review their restricted trading laws. She said according to the ANRA survey, 50 per cent of regional West Australians were likely or very likely to take advantage of extended trading hours. But Albany’s Maggie van Santen and Becki Shaver prefer to make the most of their ability to shop from the comfort of their own home. 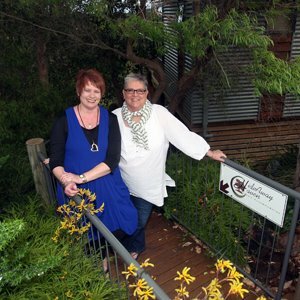 As the owners of a retreat in Albany, the couple often work long hours and find it convenient to turn to online stores when buying things such as linen, crockery, glasses and cleaning products. But it does not stop at business supplies, with both women choosing to buy presents, clothes and other goods. Ms van Santen said she turned to online shopping because of the convenience, but argued extended trading hours would not necessarily encourage her to choose store shopping over the internet. “We get great customer service online and even if the shops were open until 9pm I am not sure if we would get dressed and go out shopping,” she said. Albany Chamber of Commerce and Industry chief executive Graham Harvey said the chamber had been trying to convince local retailers for some time that their biggest threat was not major retailers, but rather what was happening in the online space. He said the ANRA figures showed people were being driven online by shopping times and a lack of access to goods. “What is driving people to shop online is not price, as most would believe, but rather the lack of customer service at the regional shop front, which includes the availability of choice of goods and the availability of opening hours,” he said. City of Albany Mayor Dennis Wellington agreed online shopping was a concern, but he did not see extended trading hours as a solution to encouraging people to buy local in Albany.